This mod changes a lot in the game: new colors for cars and text, new options for transport and weapons, increases the bloom effect, new icons for the radio, something in the in-game Internet, the effects of the explosion, increases the number of people on the street and much more. 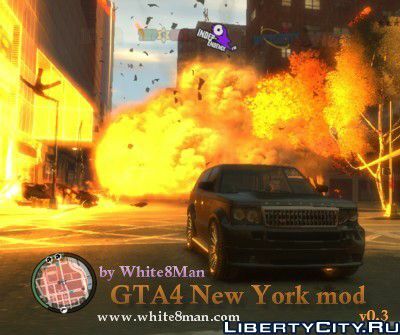 Description: A global modification that will transform Liberty City into a real New York! Installation: Run the file "setup.exe" and follow the instructions. This mod modifies the names of stations, districts, streets, advertisements and trains in the metro. Minus: the subway map is real = ( Pluses: you can enter the cars underground, great for commercials about New York! Another modification, which replaces the weather Liberty City, but now on the weather in New York. Installation: replace the pc file.